Whether you have come to enjoy the 165 miles of beautiful waterways or if you have recently moved to the area, having a toothache in Port Charlotte doesn’t have to slow you down. Since you’re in such a large city with a variety of businesses, there is no shortage when it comes to dentist offices. From pediatric dentists to general dentists and oral surgeons, you have your choice of which one you’d like to see. 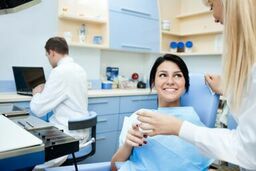 At emergencydentistsusa.com, we’ve compiled a detailed list of dentists that are available to treat you in Port Charlotte. You can see things like the hours they are available, some of the services that they offer, and also some of the insurances and discounts that are available through them. We’ve made finding a new dentist or locating an emergency dentist quick and simple. If you don’t have time to visit the web or you’re travelling, simply give our free dentist finder hotline a call. One of our friendly operators will gladly assist you with finding the dentist that is perfect for you. They’ll be glad to set up your first appointment and can even give you directions to the office. Once your appointment is made, be sure to arrive 15 to 20 minutes early and bring a copy of your ID, insurance card, copay, and a list of any medications you may be currently taking. You have so many choices when it comes to dental offices in Port Charlotte. From oral surgeons to orthodontists and everything in between, there is sure to be one that can treat you on a schedule and budget that fits you. If you’re having an emergency, it is likely that you’ll be scheduled fastest with a general dentist who can refer you to an oral surgeon, if needed. Description: Dragonfly Dental of Port Charlotte treats patients of all ages. They provide the most technologically advanced services possible to their patients. By understanding their patient’s needs, they are able to provide the best treatments possible. Description: Dr. Jakubaitis provides a variety of dental services to his patients. From cosmetic dentistry to general dentistry and dentures, he handles all aspects. His team prides themselves in being able to handle all of their client’s needs. Description: The office of Panther Hallow Dental Lodge takes pride in teaching their patients to practice preventative maintenance. They use state-of-the-art technology to keep their patient’s smiles as beautiful as possible. With a beautiful and serene environment, they keep their patients as comfortable and happy as possible. Any kind of tooth pain that has lasted longer than a couple of hours should be treated immediately. If your tooth or mouth hasn’t suffered any trauma such as a sport’s injury or a fall, then it could be an infection. If it is an infection, it has occurred over time and is now reaching the sensitive area of the tooth and gums. Leaving this untreated could allow it to spread and cause damage to other parts of the mouth, including other teeth and the gums. Any time you visit a new dentist, be sure to check their credentials to make sure that they are up to date. You can do this when you go into the office or you can take a look online before your appointment. To view them online, enter your doctor’s name at the South Florida Dental Association website.